You are now able to purchase our images from Fine Art America as fine art metal prints. The image is the art... no frames or mats to distract from the work. 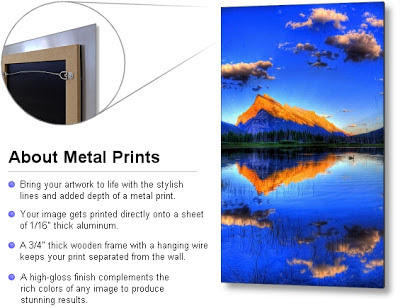 Fine Art America takes care of everything - all metal prints ship within 2 - 3 business days and arrive "ready to hang" with a hanging wire, mounting hooks, and nails. Grab a hammer... nail the mounting hook into your wall... and you're done! If you like one of our images that is not yet on FAA, (you can view a selection of images via the Galleries above) just contact us and we shall get it uploaded for you.